With poor prognosis and limited treatment options for advanced hepatocellular carcinoma (HCC), development of novel therapeutic agents is urgently needed. This single-arm phase I study sought to assess the safety and preliminary efficacy of icaritin in human as a potential oral immunotherapy in addition to the immune-checkpoint inhibitors. Eligible advanced HCC patients with Child-Pugh Class A or B were administered with a fixed oral dose of icaritin at either 600 or 800 mg b.i.d. The primary endpoint was safety, and the secondary endpoints included time-to-progression (TTP), overall survival (OS) and the clinical benefit rate (CBR). Icaritin treatment induced immune biomarkers and immune-modulating activities in myeloid cells were also explored. No drug-related adverse events ≥ Grade 3 were observed in all 20 enrolled HCC patients. Among the 15 evaluable patients, 7 (46.7%) achieved clinical benefit, representing one partial response (PR, 6.7%) and 6 stable disease (SD, 40%). The median TTP was 141 days (range: 20-343 days), and the median OS was 192 days (range: 33-1036 days). Durable survival was observed in PR/SD patients with a median OS of 488 days (range: 72-773). TTP was significantly associated with the dynamic changes of peripheral neutrophils (p = 0.0067) and lymphocytes (p = 0.0337). Icaritin treatment induced changes in immune biomarkers-and immune-suppressive myeloid cells were observed. Icaritin demonstrated safety profiles and preliminary durable survival benefits in advanced HCC patients, which were correlated with its immune-modulation activities and immune biomarkers. These results suggested the potential of icaritin as a novel oral immunotherapy for advanced HCC in addition to antibody-based PD-1/PD-L1 blockade therapies. NCT02496949 (retrospectively registered, July 14, 2015). Ying Fan, Shu Li and Xiaoyan Ding contributed equally to this work. The online version of this article ( https://doi.org/10.1186/s12885-019-5471-1) contains supplementary material, which is available to authorized users. Hepatocellular carcinoma (HCC) is the fifth most common cancer and the third leading cause of cancer death worldwide [1, 2]. More than 50% of the overall new HCC cases indeed occur in China, largely in association with chronic hepatitis B virus (HBV) infection. 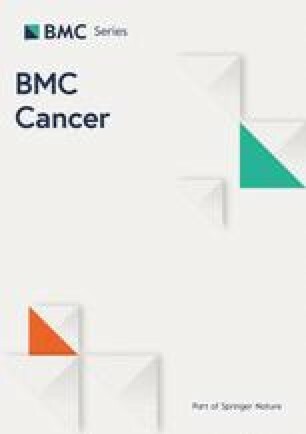 Although surgical resection and transplantation have improved survival of patients with small tumours, most HCC patients are inoperable due to late diagnosis at the metastatic stages. Chemotherapy in advanced HCC is generally considered as unsatisfactory with a response rate of < 10% and minimal improvement in survival. Sorafenib mono-therapy has a limited impact on HCC statistics, particularly in China and most developing countries, likely due to co-existing hepatitis B virus (HBV) infection, high cost needed and limited access to the remedy . During the past decades, most of the single- or multi-targeted therapeutic phase III trials were demonstrated to be challenging to achieving acceptable objective response rate (ORR) or overall survival (OS) in advanced HCC [1, 3]. Nivolumab (CheckMate040) demonstrated promising results in advanced HCC in an early phase I/II trial , yet a significant fraction of HCC patients still remained not-responsive. Thus, there is a need to identify novel and cost-effective therapies aiming for survival improvement in advanced HCC patients . Small molecule immune-modulating agents might be particularly suitable for treating advanced HCC patients because: 1) the dysfunctional liver is vulnerable with limited therapeutic tolerability and 2) HCC tumour microenvironment is particularly immune-tolerogenic . Unfortunately, only a few small molecule-based immune therapeutic agents  have been explored in advanced HCC patients [7, 8, 9]. Icaritin, a single molecule with > 98% purity, is derived from Epimedii herba, a traditional Chinese herbal remedy used for immune modulation . 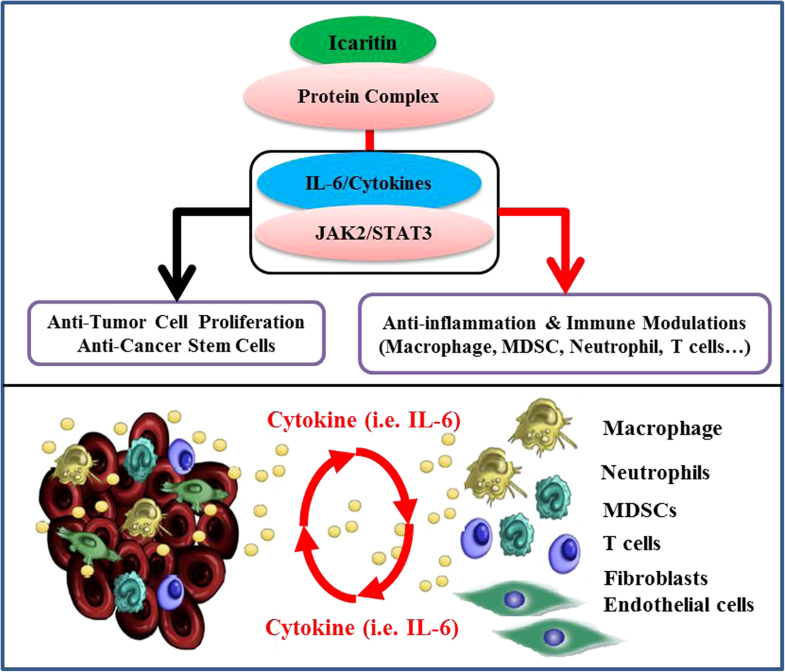 Icaritin treatment associated anti-cancer and immune-modulation activities through IL-6/Jak2/Stat3 pathways have been demonstrated in cancer cells [11, 12] (Additional file 1: Figure S1) as well as in immune cells including cytolytic natural killer (NK) /T cells, interferon- gamma (IFN-γ)-producing CD8+ T-cells and immune-suppressive myeloid-derived suppressor cells (MDSCs) . We have previously shown that icaritin exhibits anti-proliferative activities both in cancer cells and in cancer-stem cells through the IL-6/Jak2/Stat3 pathway both in vitro and in vivo . The present study aimed to explore the safety and immune activities of icaritin as a potential oral immunotherapy agent in advanced HCC, offering an alternative or complementary to antibody-based PD-1/PD-L1 blockade therapies. Icaritin was supplied by Beijing Shenogen Biomedical Ltd. (manufactured by Kangerfu Pharmaceutical Industry Co., Beijing, China). The drug was in oral capsule form with corn oil as the main solvent vehicle (100 mg of icaritin per capsule). Based on previous toxicological data, pharmacokinetic results and a previous dose-escalating clinical phase Ia study results (Additional file 2: Figure S2), a multiple-dose trial was conducted by administering icaritin orally twice daily (b.i.d.) at two fixed doses of 600 and 800 mg employing a 28-day treatment cycle. Therapeutic activities and responses were evaluated every two treatment cycles. Treatment was continued until disease progression, intolerable toxicity, or patient’s decision on stopping the treatment. The medication was allowed to continue after confirmed disease progression at the discretion of physicians given the extremely limited choice of treatment modality in HCC. The study was performed in accordance with good clinical practices (GCPs) and the Declaration of Helsinki Guidelines. The study protocol was approved by an institutional review board (IRB), and written informed consent was obtained from all participating patients for enrolment as well as for data collection and data publication. This trial was registered in clinicaltrials.gov website (https://clinicaltrials.gov/ct2/show/NCT02496949). Patients were examined monthly for adverse events, including physical examination, haematological and clinical biochemical tests. Adverse events (AEs) were assessed according to the National Cancer Institute Common Terminology Criteria for Adverse Events version 4. All patients who received at least one dose of the study medication (intention-to-treat population) were assessed for safety. Tumour assessments were performed with computed tomography or magnetic resonance imaging (MRI) at baseline and then every 2 months until confirmed disease progression. Each scan was assessed by both an investigator and a radiologist expert. Objective response was evaluated according to Response Evaluation Criteria in Solid Tumours version 1.1 (RECIST1.1) . OS was measured from the date of enrolment until death from any cause. TTP was defined as the time from the date of enrolment to confirmed disease progression. Clinical benefit rate (CBR) was evaluated by calculating the percentage of subjects showing complete response (CR), partial response (PR) or stable disease (SD). The immune and haematology tests were performed in a registered clinical laboratory. The tests included platelet, neutrophil, and lymphocyte counts, which allowed for the calculation of the neutrophil-to-lymphocyte ratio (NLR), systematic immune-inflammation index (SII), and platelet-to-lymphocyte ratio (PLR) based on previously reported methods [16, 17]. The circulating biomarkers including AFP, IL-6, IL-8, IL-10, TNF-α, and IFN-γ, were measured during the time course of icaritin treatment. Immune-modulating activities of icaritin in macrophages and MDSCs in vitro were performed in bone marrow-derived macrophages and cord blood-derived MDSCs (CB-MDSCs), respectively (Fig. 3 and Additional file 3). The present study was an adaptive phase I trial that started with a dose escalation (Part I) to explore the tolerability of icaritin in different solid tumour patients followed by Part II to further evaluate the safety of icaritin at both dose levels of 600 and 800 mg b.i.d in advanced HCC (Additional file 2: Figure S2). Moreover, the preliminary drug efficacy was assessed as a secondary objective, which was not fully statistically powered with the sample size calculation. Twenty subjects may offer a high probability to observe several cases showing the preliminary activities of complete or partial response (CR, PR) and stable disease (SD) after the icaritin treatment. Icaritin was estimated to achieve a CBR of 35% in advanced HCC, and 20 subjects would provide a 75% chance to observe at least 6 cases showing clinical benefits. Continuous variables were presented as the mean values with standard deviation, and categorical variables were presented as frequencies (percentages). The safety profile was evaluated mainly by the incidence of drug-related adverse event (AEs). Subjects demonstrating PR and SD were counted, and the percentages were calculated along with CBR. All p values were based on a two-sided test to define the difference, and a difference at p ≤ 0.05 was considered statistically significant. The OS and TTP curves were estimated by the Kaplan-Meier method along with medians and their 95% confidence intervals. A log-rank test was used to compare the survival curves between different subgroups and aimed to identify biomarkers that could differentiate the treatment effect. X-tile 3.6.1 software (Yale University, New Haven, CT, USA) was used to determine the cut-off values for the exploratory biomarker assessment . All statistical analyses were performed using GraphPad Prism and SAS 9.4 (SAS, Inc., Cary NC, USA). From November 2011 to August 2013, 20 HCC patients were enrolled in Part II as the following: enrolled first in the 600 mg b.i.d. group (n = 14) and then in the 800 mg b.i.d. group (n = 6). The patient characteristics at baseline are summarized in Table 1. The median age was 55 (range: 31–73) years old. All patients were in good performance status (ECOG 0/1), except for one patient. Most patients were categorized as Child-Pugh A (18 of 20) and BCLC stage C (19 of 20). HBV infection was predominant, and one patient had hepatitis C virus (HCV) co-infection in the 600 mg b.i.d. group. One patient in the 600 mg b.i.d. group and 3 patients in the 800 mg b.i.d. group had previously been treated with sorafenib, yet they qualified in this study based on the pre-established inclusion criteria. In general, icaritin treatment was well tolerated. Of the 145 AEs reported, 115 (79.3%) were in the 600 mg b.i.d. group, and 30 (20.7%) were in the 800 mg b.i.d. group. Among the AEs, 10 (6.9%) were characterized as potentially drug-related, which included 8 AEs in the 600 mg b.i.d. group and 2 AEs in the 800 mg b.i.d. group. The most common AEs were hyperbilirubinemia (n = 13) followed by increased aspartate aminotransferase (n = 8), elevated transaminase (n = 7), upper respiratory infection (n = 6), and increased gamma-glutamyl transpeptidase (n = 5). No drug-related Grade 3/4 AEs were observed. No immune-related AEs, such as interstitial lung disease, thyroid dysfunction, or auto-immune hepatitis were found. The details of drug-related AEs are listed in Table 2. There were eight instances of serious AEs (SAEs) among the advanced HCC patients (Table 2) as the following, which were not considered as study drug-related: 2 cases of GI bleeding, and 6 SAEs of dyspnea, haematosepsis, liver abscess, epilepsy, sudden cardiac death, and liver function failure (one for each case). These SAEs are commonly observed in advanced HCC patients with more refractory conditions, but none of the SAEs were considered drug-related per the clinical investigator’s assessments. Twelve of the fourteen patients in the 600 mg b.i.d. group were evaluated for best response as the following: one (8.3%) achieved PR; five (41.7%) attained SD, and six (50.0%) demonstrated progressive disease (PD). In the 800 mg b.i.d. dose group, only three cases were evaluated: one attained SD and two demonstrated PD. Five of twenty patients were not evaluated due to withdrawal or occurrence of SAEs, such as gastrointestinal bleeding prior to imaging. The median TTP was 141 days (range: 20–343 days), and the median OS was 192 days (range: 33–1036 days). In the 600 mg b.i.d. group, 5 cases (41.7%) received icaritin for at least 5 cycles (5 months) before PD was confirmed. In the 800 mg b.i.d. group, one subject (16.7%) completed 4 cycles of treatment. Durable survival was observed in PR/SD patients with a median OS of 488 days (range: 72–773 days). As described above, patients were allowed to continue the study medication after tumour progression. Of the 6 patients choosing to continue (take off-study) icaritin treatment in the 600 mg b.i.d. group, five patients had an extension of more than 6 months (median: 450 days, range: 197–977 days), and one had an extension of only 88 days due to sudden death from cardiac disease (Table 2). One patient who continuously took icaritin reached the longest survival time of 1036 days (Fig. 1A). To characterize the immune dynamics associated with icaritin treatment induced survival improvement in advanced HCC, a panel of immune-inflammation dynamic indices, including neutrophils, lymphocytes and platelets, along with NLR, SII and PLR were explored. With one-year survival as the cut-off, two clinical-benefit subgroups were identified as the following: 7 patients (35%) with a median OS of 488 days and 13 patients (most are refractory with less than 2 treatment cycles) with a median OS of 95 days (Fig. 1A). 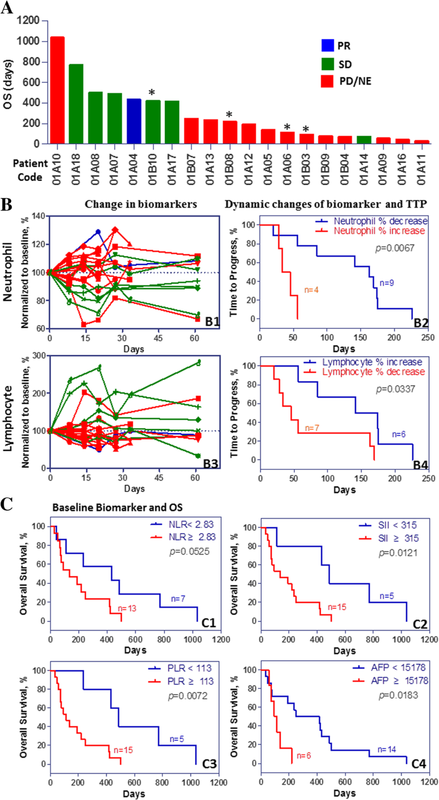 The decrease in neutrophils and increase in lymphocytes were significantly (p = 0.0067 and p = 0.0337, respectively) associated with TTP by Kaplan-Meier analysis (Fig. 1B). The OS was also significantly associated with baseline biomarkers using the cut-off values of 2.83 for NLR (p = 0.0525), 315 for SII (p = 0.0121), 113 for PLR (p = 0.0072) and 15,178 for AFP (p = 0.0183) (Fig. 1C). A significant difference between the HCC subgroups of OS≥365 vs. OS< 365 days with baseline PLR medians of 80.25 vs. 177.51 (p = 0.0395, Additional file 4: Figure S4) was observed. These observations were consistent with the previous finding that PLR may predict HCC treatment outcomes  and immunotherapeutic efficacy . Interestingly, after icaritin treatment, circulating plasma levels of IL-6, IL-7, IL-8, IL-10, IL-15, AFP, and DKK1 were decreased by up to 2 folds, and circulating plasma levels of IFN-γ were increased by up to 3 folds in PR and SD, but not in PD patients (Additional file 5: Figure S5). One patient, a 62-year-old male, had a PR after two consecutive cycles of icaritin treatment. This patient started the medication after progression on transcatheter arterial chemoembolization (TACE) due to newly identified multiple abdominal lymph node metastases. Tumour lesion shrinkage was observed at 8, 16, and 32 weeks post-treatment compared to the CT image at baseline (D0) with the RECIST1.1 evaluation standard (Fig. 2A). After 4 cycles (16 weeks) of treatment, the target lesions were assessed as CR (Fig. 2A, left bottom), and the total objective response was PR, given the presence of non-target liver lesions (Fig. 2). Baseline levels of NLR, PLR and SII were 1.66, 58, and 192, respectively. The baseline AFP level was 5216 ng/ml at pre-screening and it continuously declined to 6.7 ng/ml during treatment (Fig. 2B). 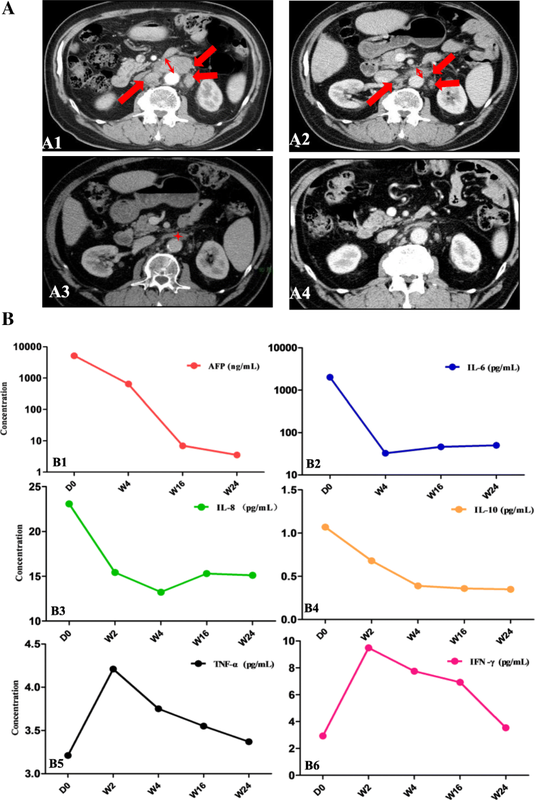 Circulating IL-6, IL-8, and IL-10 levels were concomitantly decreased along with tumour shrinkage after 24 weeks of treatment. Interestingly, the IFN-γ level was increased by up to 3 folds after 2 weeks of icaritin treatment, which may indicate the cytotoxic immune T-cell priming or activation (Fig. 2B). Based on the findings that icaritin treatment-induced responses of neutrophils and lymphocytes were significantly associated with TTP, the immune-modulation activities of icaritin were investigated. After treatment of macrophages with 2 and 10 μM icaritin for 24 h, the expression of the gene panel representing M1-type macrophages (i.e., INOS, TNF-α and CXCL-10) was increased, whereas the expression of the gene panel representing M2-type macrophages was decreased (i.e., Arg-1, Ym1 and Fizz1) (Fig. 3A) . In addition, the MDSC populations (both CD14+/M-CSFR+ and CD15+/M-CSFR+ cells) were significantly reduced by icaritin (2.5 μM, 72 h, p < 0.05) treatment (Fig. 3B). These findings may further confirm the immune-modulating associated antitumor activities of icaritin on the immune cells including MDSCs , neutrophils , and macrophages . The main purpose of this study was to evaluate the clinical safety profiles of icaritin in advanced HCC with optimized doses. Icaritin demonstrated high tolerability (only grade 1/2 drug-related AE observed) in advanced HCC patients. The most common AE was hyperbilirubinemia, which may understandingly be disease-related. No immune-related AEs, such as interstitial lung disease, thyroid dysfunction or auto-immune hepatitis were found. Combined with data from the Part 1 dose escalation study, icaritin demonstrated favourable safety and tolerability in advanced HCC patients. Our preliminary data also showed that the response and mortalities did not correlated with icaritin dosages of 600 vs. 800 mg b.i.d. (Additional file 6: Table S1 and Additional file 7: Figure S3), which was consistent with the observations in other immune oncology trials [24, 25]. Icaritin demonstrated preliminary efficacy of a comparable overall response rate but likely with a more durable survival compared to HCC patients treated with sorafenib in ORIENTAL trial  (Additional file 8: Table S2). It is well-acknowledged that the duration of cancer control and OS are critical endpoints for advanced HCC [3, 27] rather than objective response rate (ORR < 10% often observed in HCC trials and different from other solid tumours) [15, 28]. Moreover, two major confounding factors should be taken into consideration in preliminary efficacy assessment justification. First, patients enrolled in this study were much more refractory than those in the sorafenib (ORIENTAL) trial in terms of extrahepatic metastases (90% in this study vs. 68.7% in sorafenib ORIENTAL) and Child-Pugh class B (10% in this study vs. 3% in sorafenib ORIENTAL) (Additional file 8: Table S2). Second, fewer (6/20) patients were maintained on treatment after disease progression compared to that of the ORIENTAL trial, in which most patients continued with sorafenib treatment after progression. Indeed, five of the six patients had a median icaritin treatment duration of 15 months (range: 6.5–33 months), and all six patients achieved median survival of 488 days (95% CI: 406–570 days). These results suggested that post-progression treatment with icaritin may provide a durable survival benefit in advanced HCC, which was often observed in other immune oncology studies [29, 30]. In addition, the present study demonstrated that icaritin treatment significantly blocked immune-suppressive activities in myeloid cells (Fig. 3). Our results were consistent with recent findings that immune suppressive neutrophils and macrophages might be essential immune-modulating targets beyond immune checkpoint blockage (PD-1/PD-L1) [31, 32, 33]. 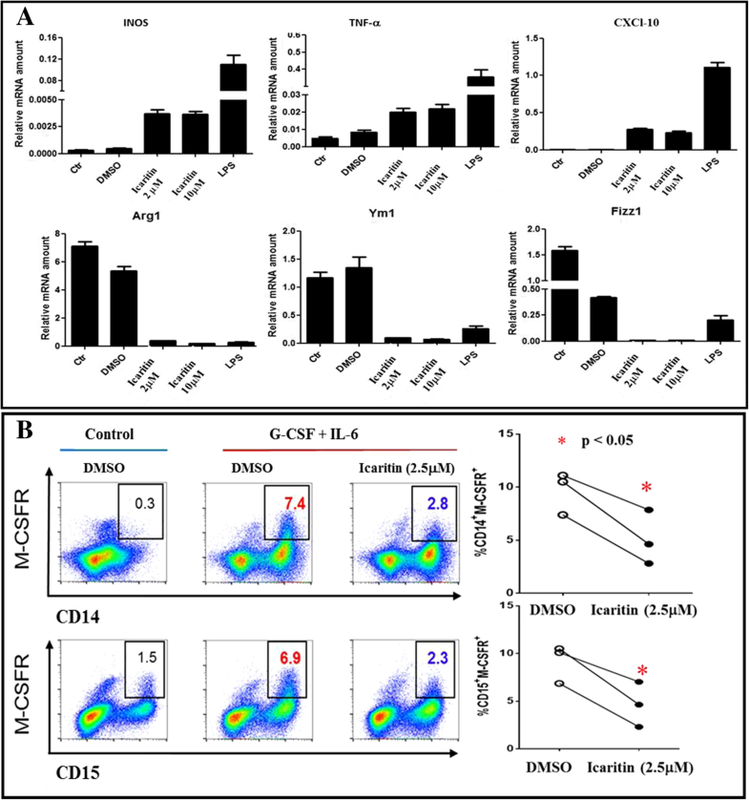 Significance of icaritin induced anti-cancer associated immune-suppression modulation was clearly demonstrated by showing the dynamic changes in neutrophils (Fig. 1), gene expression pattern in macrophages and functional profiles in myeloid cell populations (Fig. 3). Combined data suggests that icaritin could play significant roles and contribute to the synergized anti-inflammation and anti-immune tolerance activities in advanced HCC (Fig. 4). In addition to the immune checkpoint pathways , modulation of immune suppressive MDSC cells and inflammation associated cytokine and chemokine may enhance the anticancer efficacy of immune therapy and patient overall survival [35, 36, 37], particularly in advanced HCC [22, 38]. Anti-IL-6/Stat3 and associated molecular pathways have shown great potential in anti-inflammation and cancer immunotherapy [39, 40, 41]. Small molecule based immune-modulation and associated IL-6/STAT3 pathways deserve more translational and clinical investigations. Immune-modulation therapy clinical trial of small molecule icaritin in advanced HCC would provide valuable - supporting evidence that anti-cancer and immune-modulation activities via IL-6/Stat3-associated protein networking may help to address the challenge of high immune-tolerance in HCC, in addition to the immune checkpoint pathways (Fig. 4). The present study demonstrated preliminary clinical activities of icaritin including safety, durable survival and panel of immune biomarkers associated with anti- immune-suppression activities in myeloid cells [19, 23, 42]. Both clinical safety and preliminary efficacy of icaritin demonstrated in this report should support further clinical development in advanced HCC and other solid tumours. We thank all patients, families, and caregivers for their support to this study. We also thank Dr. Jian Peng for his kind efforts to facilitate collaborations as well as Chao Zhang and Zheng Yuan for their delegated efforts in data monitoring. Beijing Shenogen Biomedical Ltd. (as sponsor), and Chinese Academy of Medical Science (CAMS) Initiative for Innovative Medicine (Ref: CAMS-12M-1-010, as non-profit organization). Funding body (CAMS) has no roles in design of the study, collection, analysis and interpretation of data or in manuscript writing. The data that support the findings of this study are included in this publication, and the related supplementary files. All patients provided written informed consent before enrolment. The study was performed in accordance with good clinical practices and Declaration of Helsinki guidelines. Approval from the appropriate ethics committees and institutional review boards was obtained and documented before the study. (Name of Ethics committee: Cancer Hospital, Chinese Academy of Medical Sciences, National GCP Center for Anticancer Drugs; Ethic approval letter ID: 11–95/530, Clinical Protocol ID: TG11141CR; Approval date: Nov. 24, 2011. This trial was registered with clinicaltrials.gov (https://clinicaltrials.gov/ct2/show/ NCT02496949). In addition to the consent form for the enrolment purpose, the signed consent forms also cover the agreement that the enrolled patients allow his/her data generated from this study to be published with blinded ID and privacy protection, regardless any format of presentation. Y F, B X, Funding from Chinese Academy of Medical Science (CAMS) Initiative for Innovative Medicine; S L and R H: Ex-employees of Beijing Shenogen Biomedical Ltd.; X D, J Y, J J, H Z, R H, W Q, K L, Y I, S W, L Z, Nothing to disclose; B Y, K M: Employee of Beijing Shenogen Biomedical Ltd.